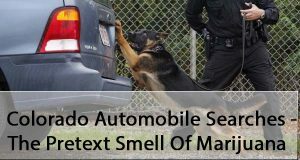 Colorado Automobile Searches – The Pretext Smell Of Marijuana –When the police make a routine traffic stop a vehicle and they want to search that car – they may – and often do – say that they smell marijuana. Later when the car is searched – no marijuana is found. This article addresses that issue. Can Colorado Police Search Your Car Based SOLELY On The Alleged Odor Of Marijuana? The use of the alleged smell of marijuana without much more – is not justification to conduct a warrantless searches of a vehicle, a home or a business. The Fourth Amendment of both the United States and Colorado constitutions (U.S. Const. amend. IV; Colo. Const. art. II, § 7) require Probable Cause before conducting a warrantless search of a vehicle stopped for a traffic matter. We all have a constitutional right to be free from unreasonable searches and seizures. The constitution mandates that EVERY warrantless search is presumptively unreasonable and therefore unconstitutional ” unless it can supported by probable cause and falls within a narrow list of defined exceptions to the warrant requirement. Colorado law permits the police to search an automobile and the containers within it where they have probable cause to believe contraband or evidence is contained. On the other hand a warrantless search violates the Fourth Amendment if there is no probable cause for the search OR the warrantless search did not fall within one of the recognized exceptions to the warrant requirement. What Then Is Probable Cause? The totality of the circumstances test for probable cause takes into consideration any and all facts that a reasonable person would consider relevant to a police officer’s belief that contraband or evidence of a crime is present. 3. The warrantless search of the vehicle was not supported by probable cause. As noted above, when Colorado Trial Judges test the validity of a police officer’s assertion that the officer had probable cause to search – that Judge is required to use the “totality of the circumstances test” to evaluate the quantum of evidence arising from the investigation and whether that quantum supports probable cause. While the odor of marijuana, even in Colorado, cannot be the sole basis for a finding of probable cause – Zuniga now holds – notwithstanding the fact that marijuana is now legal to consume in Colorado after Amendment 64, that the odor CAN contribute to probable cause under totality of the circumstances test. A possible innocent explanation or lawful alternative may add a level of ambiguity to a fact’s probative value in a probable cause determination, but it does not destroy the fact’s usefulness outright and require it to be disregarded. The Colorado Criminal Courts – after Zuniga – will treat non-criminal and “legally ambiguous” facts such as the alleged smell of marijuana coming from a traffic stop – in “the mix” that is the standard probable cause analyses in Colorado. Omitting these types of facts from the analysis based on the possibility that they could arise from innocent behavior contravenes the very purpose of the totality of the circumstances test by ignoring the possibility that they could equally give rise to an inference of criminality. In Colorado, the best strategy to combat the issues raised in Zuniga include the investigation should include the locating and the interviewing of witnesses that were present in the car – or perhaps nearby – as close to the time of the traffic stop as possible. The best source of that information is the Defendant himself. He or she will know who was present at the time of the stop. The investigation to locate and interview (and take written statements) should be handled by an investigator if possible – not the defense lawyer and that is because of the need to possibly call that investigator at trial. The claim of an odor of marijuana by a police officer that is fake – phony – or a “pretext” to somehow justify or “contribute” to a finding of probable cause for a warrantless search of a vehicle – will always come down to the credibility of the police officer or officers involved who are making the claim. How many police officers were present? How many actually smelled the odor of marijuana? Did the file their reports contemporaneously? Did they describe the alleged odor similarly? Did they read one another’s reports before writing their own or before tesifying? (and) Most importantly – was ANY marijuana actually found in the vehicle or on the Defendant or others present? No stone should be left unturned..
ABOUT THE AUTHOR: H. Michael Steinberg – Email The Author at mailto:hmsteinberg@hotmail.com– A Denver Colorado Criminal Defense Lawyer – or call his office at 303-627-7777 during business hours – or call his cell if you cannot wait and need his immediate assistance – 720-220-2277. Attorney H. Michael Steinberg is passionate about criminal defense. His extensive knowledge and experience of Colorado Criminal Law gives him the edge you need to properly handle your case. You should be careful to make a responsible choice in selecting a Colorado Criminal Defense Lawyer – and we encourage you to “vet” our firm. Over the last 30 plus years – by focusing ONLY on Colorado criminal law – H. Michael has had the necessary time to commit to the task of constantly updating himself on nearly every area of criminal law, to include Colorado criminal law and procedure and trial and courtroom practice. H. Michael works hard to get his clients the best possible results in and out of the courtroom. He has written, and continues to write, extensively on Colorado criminal law and he hopes this article helps you in some small way – Colorado Automobile Searches – The Pretext Smell Of Marijuana.